WHAT: The Mizzou Botanic Garden is celebrating the University of Missouri’s 175th Anniversary by welcoming P. Allen Smith, TV host, author, and gardening & lifestyle expert, to participate in the celebration of President Thomas Jefferson’s birthday and other gardening events on campus. Smith is a recognized and respected garden and design expert, providing ideas and inspiration through multiple media venues, including several programs on PBS. In 2009, Smith founded the Heritage Poultry Conservancy, an organization dedicated to the preservation and support of all threatened breeds of domestic poultry. As host of the nationally syndicated television series P. Allen Smith’s Garden to Table, Smith has become an expert on local food. He has also expressed particular interest in the life and gardens of Thomas Jefferson throughout his career. NOTE: Events are free and open to the public. 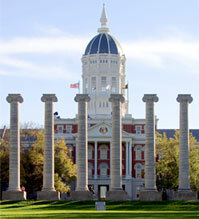 For a full schedule of events visit: http://www.cf.missouri.edu/pallensmith/. In case of inclement weather on Sunday, the outdoor birthday celebration will be held in the main lobby of Jesse Hall.